The lectern consists of a revolving top with double book rest with dental moulding to the top and carved arched finials to either end with pierced quatrefoil decoration to the sides, the brass candle holder supports remaining but unfortunately original candle holders missing. The top is supported by a circular dental moulding collar leading down to a highly decorative carved and pierced Gothic style tri-form base. The decorative base consisting of carved spires and Gothic style tracery influenced by 15th century designs. 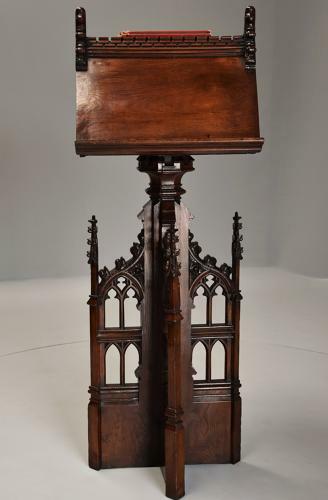 This lectern is in excellent condition, is of stable construction and can go straight into a home - it would also be an ideal item for a hotel/restaurant or book shop/collector.